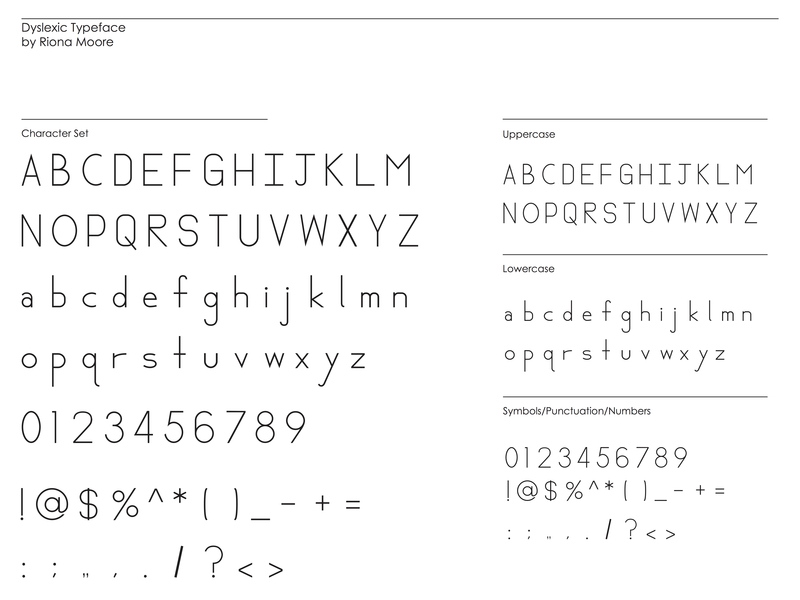 Riona Moore is building a dyslexia-accommodating typeface for a Final Project at the University of the Arts in London. She requested feedback on her work, and I thought it was fantastic. It is another choice in typefaces that emphasize readability and unique character shapes. Happy Holidays! This Holiday Season, I have a special treat for you. The all time #1 request/question for OpenDyslexic has been some form of "can I get this on my iPad/iPhone?" The answer used to require jailbreaking (thanks to iPhoneRuler, for providing the Open-Dyslexic package). The last stable version of OpenDyslexic was released in November 2012. In December of 2012, I had the fantastic privilege of sharing OpenDyslexic at TEDxGateway in Mumbai. There's been a whirlwind of interviews and OpenDyslexic has been shared continually by many people. My server has gone out a few times from the traffic! Since that time, it's been picked up by a huge number of application developers, authors, websites, linux distro's, and has been downloaded well over 111,000 times!